You never know what the fashion world might come up with in each new season. Sometimes it’s retro-inspired items and others it’s out-of-this-world futuristic designs. In 2018, the fashion world seems to have embraced a combination of both. From 1990s throwback glasses to some insane wearable tech, check out this list of fashion trends that will be the most popular in 2018. At the beginning of each year, Pantone reveals what the “Color of the Year” will be. While Pantone originally started as a printing company and has had their hand in everything from fabric to paper products over the years, they also introduced a color matching system. Needless to say, their color choice is always spot on when it comes to fashion. 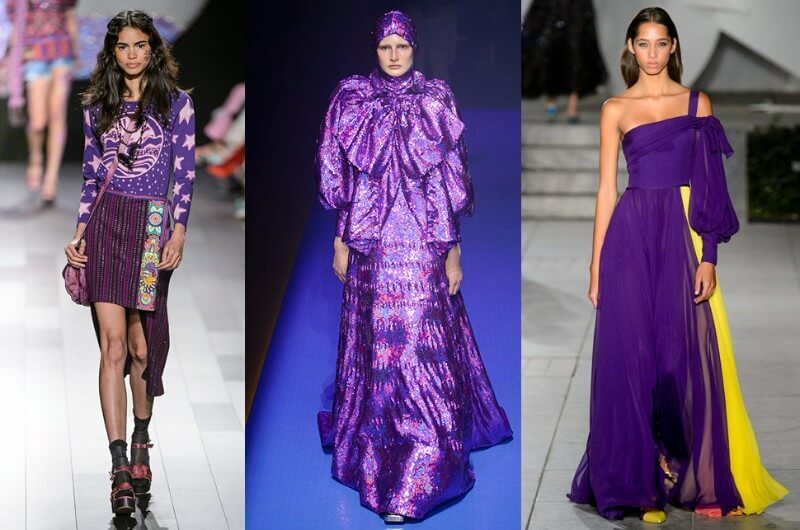 This year their color of the year was “Ultra Violet” and sure enough, we have already seen the color take the runways. A lighter and more palatable version in the form of lavender also hit the runway at shows like Proenza Schouler and Victoria Beckham. Wearable tech offers some of the most outlandish items that make us feel as though we have been transported to the future. 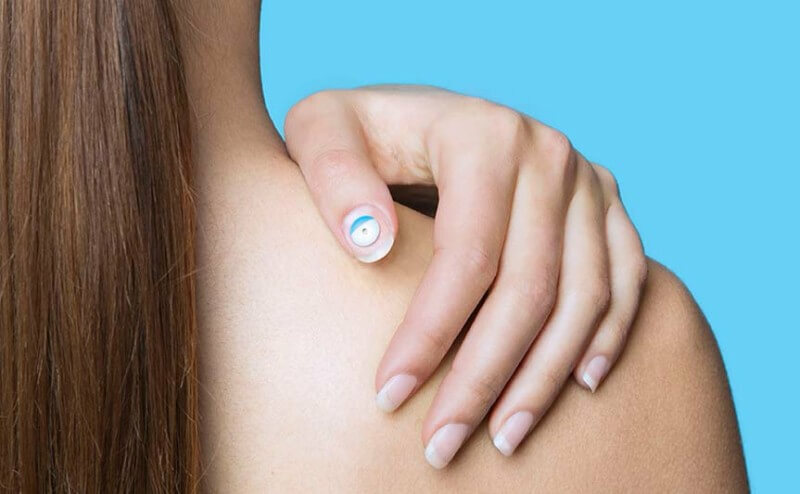 Beauty company L’Oréal has even gotten in on the new kind of accessories and they recently revealed a piece that is aimed at helping you stay healthy. The company created a UV monitoring patch. The patch is so tiny it can fit on your thumbnail, which is pretty amazing. Of course, you don’t have to wear it on your nail and you could even put it on your sunglasses. The patch monitors how many UV rays you are taking and monitors your individual data, storing it in an app that you can access from your phone. This one is for all you 1990s lovers out there. Scrunchies are back! However, they’re back with a new name, “hair clouds”. Hair clouds have been spotted on high-fashion runways like Balenciaga. The new moniker comes from designer Line Sander Johansen who says that the new name gives a scrunchie a “new chic image”. Johansen designs of the label called Comfort Objects which has been making hair wraps made from old Hermes scarves at over $112 per scrunchie. 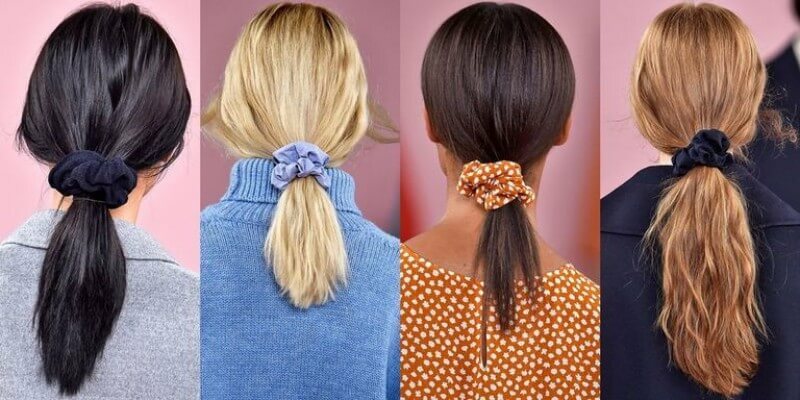 Scrunchies are now offered out at pretty much any store but we bet you could check your Mom’s hair accessories and you might find a jackpot of ’90s hair items. As far as prints go, check prints are the hottest around for 2018. The check print is found on everything from blazers to trousers but it is also printed on more interesting items like asymmetrical tops. Some fashion bloggers and mavens say that you can mix the pattern with another like floral to really drive home the style. Layering prints on top on one another is usually for the bold, but there are ways to start off without feeling totally out of your element. To make this style work for you, try choosing one print as the dominant piece and use the other to accessorize. Another easy tip is to keep all of the colors in the same family. 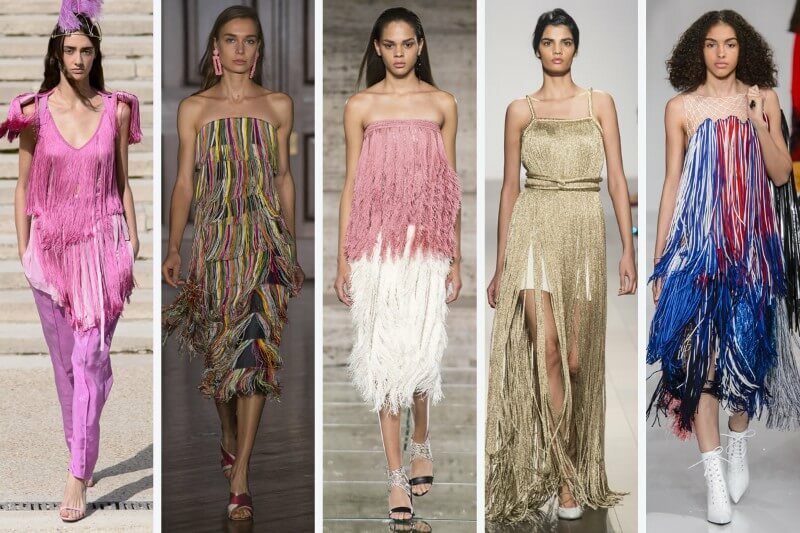 Fringe is a look that has been recycled over the years from the flappers of the 1920s to hippie style in the 1960s. Guess what? Fringe is back on the scene in 2018. Several fashion lines, including Alexander Wang and Dior, both included the style in their runway shows this year. Fringe was even spotted on the Ralph Lauren-designed gloves at the 2018 PyeongChang Winter Olympics. The thing about fringe is that it can be used on anything from entire outfits to accessories. Some looks include sleeves with fringe, dresses with fringe on the hem, gloves with fringe, bags with fringe, and even glasses with fringe. Whichever look you’re into there is something for everyone. Shoes with buckles got their start all the way back in the 1700s before showing up in various periods throughout history. Most recently: the 1990s. In 2018, the buckle shoe again geared up for its time to shine when it was featured multiple times on the runway, a sure sign that they are making a comeback. The brand Self-Portrait actually featured buckle shoes with every single one of their Spring 2018 looks on the runway. This look is pretty tame in the realm of fashion so it’s not too hard to incorporate into your own wardrobe. You can pair it with anything from a cute skirt to jeans. Mars Translation Earbuds are some of the most impressive pieces of wearable tech to be invented. These buds are able to deliver real-time translation which is a game changer when it comes to translation software. 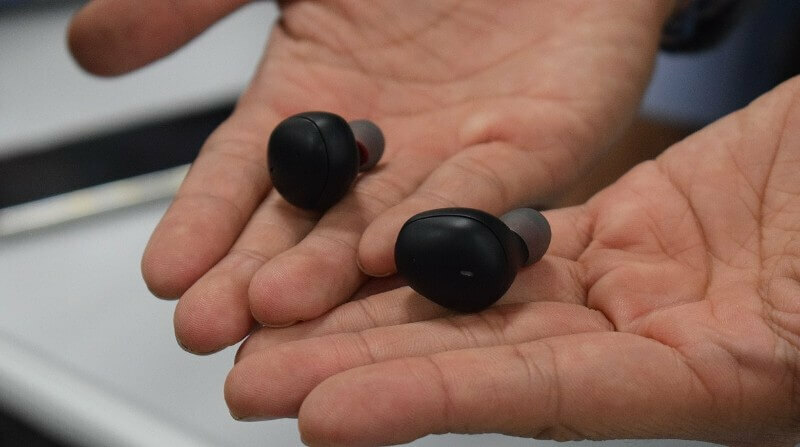 Mars Translation Earbuds are made by the Line Corporation and Naver Population and for the meantime, they are tackling the languages of English, Korean, Chinese, and Japanese. This amazing technology would allow two people who speak different languages to have a conversation in real time. This could truly be world-changing technology and will be helpful for everyone from businessmen to tourists. In Summer of 2018, the buds will launch and will also be compatible with Siri and Google Assistant. Floral patterns are a design that never goes out of style. There is essentially a new floral pattern for each season. 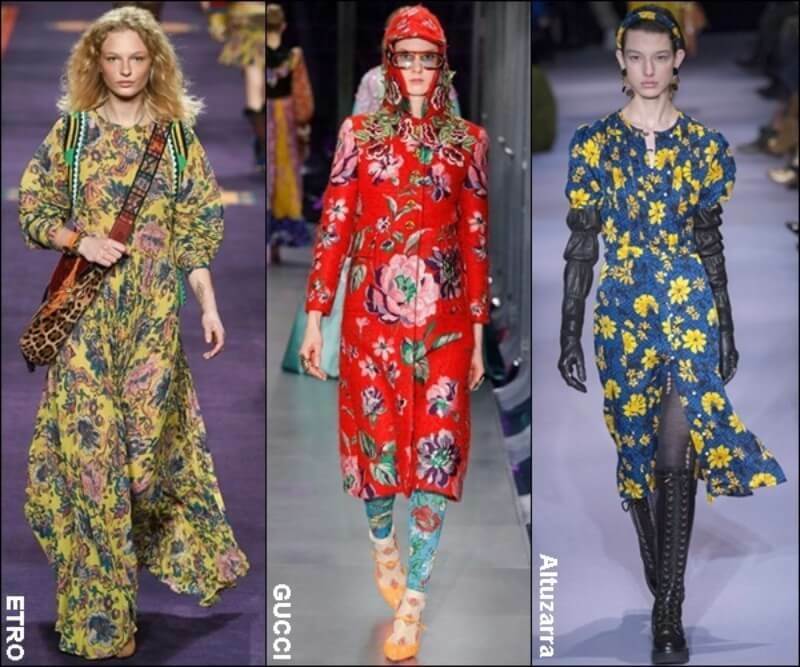 For 2018, the floral of the season takes a hint from the retro styles of the 1960s. This means the florals have dramatic colors and large floral designs. Some fashion bloggers say that the look of 2018 is to match the floral print with the aforementioned check pattern. If that’s too crazy for your taste starting with just one of the patterns is still a great and easy option to fit into anyone’s wardrobe. Jumpsuits and rompers have been all the rage for a number of years. Men even got their own version last year with the “Romphim”. This year, jumpsuits suits are still on trend but this year they are taking a more utilitarian approach. They are also being made in more muted colors like khaki and army green. This year’s style is said to be inspired by a pilot’s flight suit. While some might find them too boyish for their taste, they also often come with cinching at the waist or you can always accessorize. We’re pretty sure Johnathan from Queer Eye for the Straight Guy was even rocking one in an episode of the new hit show! We have already seen wearable tech in the form of watches with the Apple Watch but this year fashion took it to a new level. 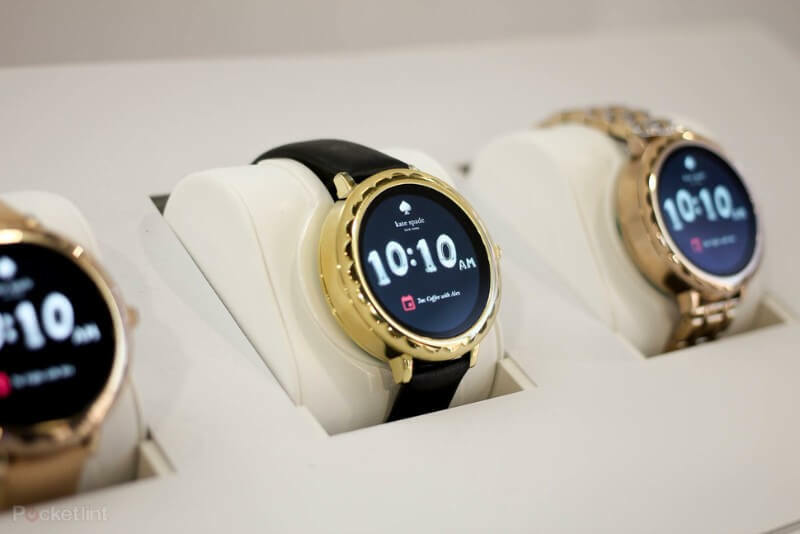 Skagen Falster and Kate Spade launched their own Android-based watches. There are also hybrid styles from Fossil, Armani Exchange, Emporio Armani, Michael Kors, and others. If you’ve contemplated getting a smartwatch in the past but were waiting for something more fashionable rather than something too tech-y or sporty, than these are probably the watches for you. The Kate Spade Android watch is gorgeous, but also gets alerts for calls and messages, plays music, is touchscreen and you can even change the face to match your outfit. Also, Kate Spade does make watch bands the Apple Watch if you’re an Apple devotee. In the realm of accessories for 2018, it’s all about oversized jewelry. This is a bit of a throwback to the 1980s when everything was larger than life. Expect to see oversized earrings and large oversized necklaces that you can even layer. Particularly over-the-top are the earrings styles. From massive hoops to earrings that dangle down to your collar bone, this year is all about extravagance. From Top Shop to Marc Jacobs, huge earrings are the hottest of the moment. 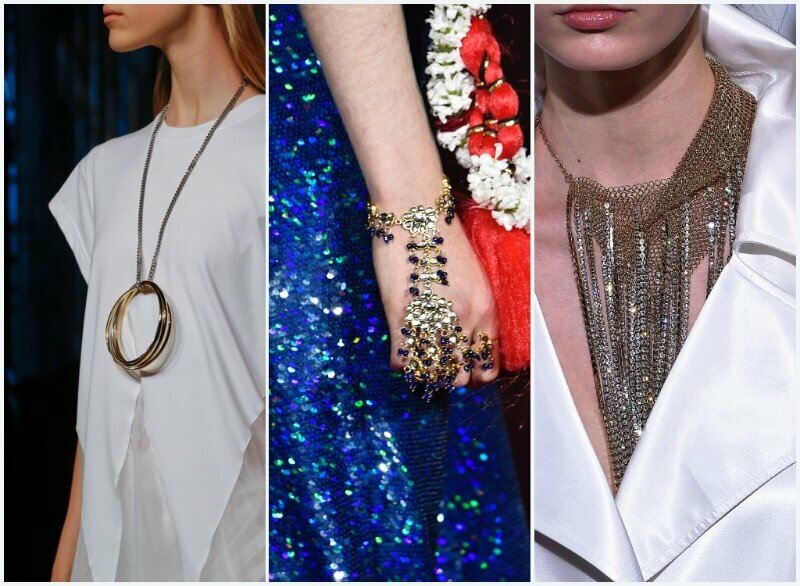 Top Shop also showcased oversized earrings with equally huge and chunky necklaces. The look might be too gaudy for some, but no one can deny the delicious decadence! PVC is all the rage in Spring 2018. We saw the look first started being incorporated into various looks last year with some heel and boot options but 2018 has taken it to the extreme. Chanel was completely inspired by the look and they did an entire runway show with a PVC theme. They had boots, heels, bags, and even coats made of clear PVC. Some people are all about this look but others feel like it’s too over-the-top and futuristic. If you are interested in including some pieces in your own wardrobe you can ease your way in by starting with once piece like a pair of gorgeous heels! 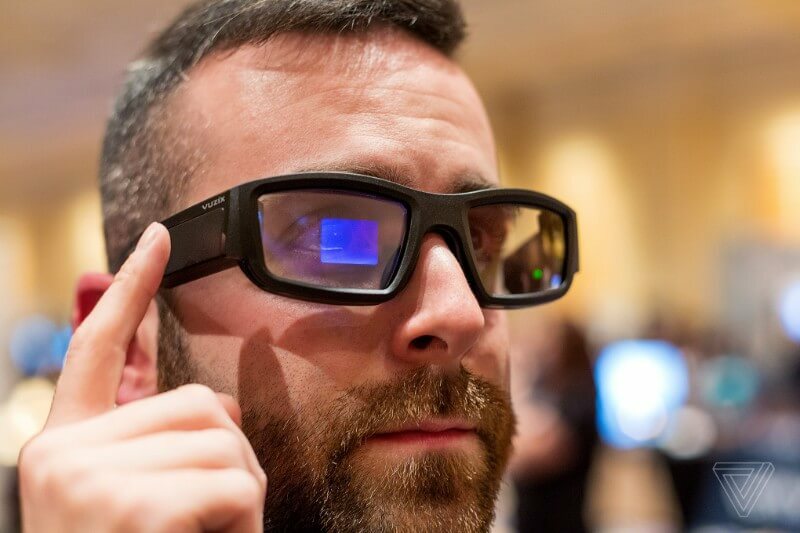 Vuzix Blade AR smartglasses are an accessory that will make you feel like you are in a 1990s movie about the future. The smartglasses are able to do an array of activities that include displaying phone notifications and offering you turn by turn directions. The glasses also come built-in with an 8 megapixel camera, which is a pretty amazing feature for glasses. 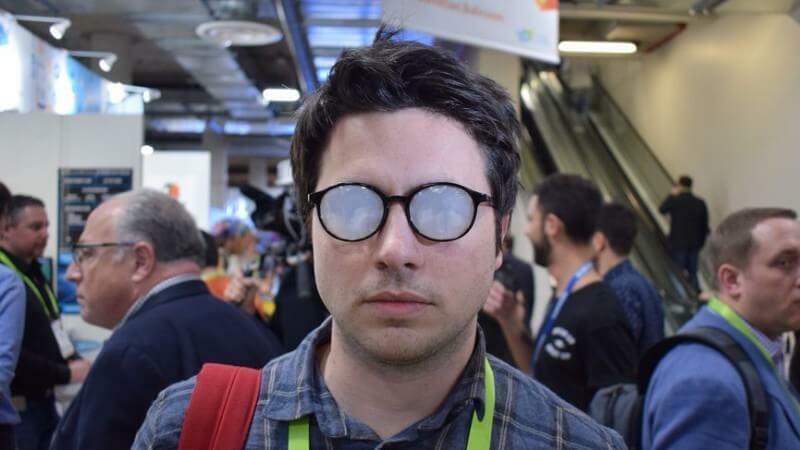 Additionally, these glasses have Alexa support which means you can take your personal assistant on the go. While many people weren’t happy with “Google Glass” the smart eyewear launched in 2013, Vuzix’ Blade smartglasses seem like a much more wearable and stylish option. While historically glitter and sequins harkens back to the fashion of the 1970s disco period and is usually strictly restricted to nightwear, 2018 is here to change the game. This year’s fashion is all about sporting glitter and sequins in the day. There are many different shades of glitter and sequins from softer colors like pink or rose gold, so there’s many ways to make them workable and wearable in your daytime outfits. Not to mention, who doesn’t love to sparkle all the time? If you’re hesitant about the look try incorporating one sparkly piece at a time. There’s just something about sparkles that makes everything seem more fun. Fisherman bags are exactly what they sound like: bags used by fishermen. The netting is obviously constructed to carry fish, however, fashionistas everywhere have realized that it also makes an excellent bag for your everyday use. Of course, unlike the original bags, these are lined so it can safely hold all your belongings. This bag has even been named as the “It” bag by several famous fashion publications including Vogue. These bags are on the larger side so you will be able to successfully carry tons of your belongings. This is one of the 2018 trends that is the most wearable for all people. 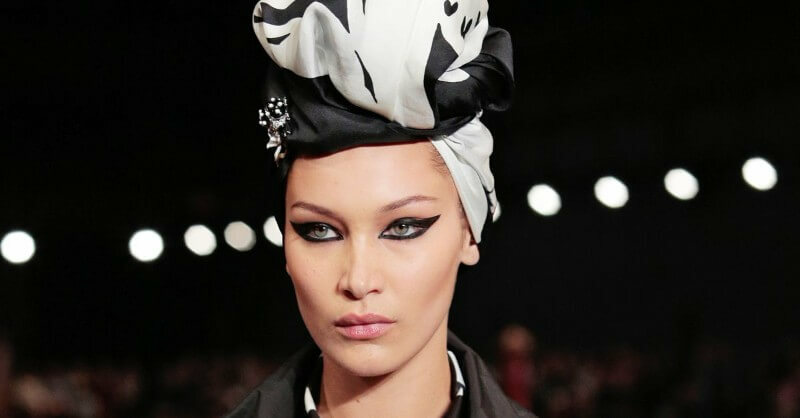 Another trend that comes with a built-in nod to the retro is the headscarf. This trend was recently seen on the runaways with both Marc Jacobs and Dolce and Gabbana in their spring collections. This trend is particularly exciting for those of us who have had bad hair days! The accessory can also beautifully accessorize an updo, bringing a retro vibe. Fendi also designed a resort collection with absolutely beautiful results. There are so many different ways to wear a head scarf that the options are basically endless when it comes to making the look work for you. For another 1990s throwback we have the return of tiny sunglasses. Kim Kardashian declared on an episode of the family show that her husband, rapper turned fashion designer Kanye West, sent her an email that said: “You cannot wear big glasses any more. It’s all about tiny little glasses.’” Kim continued, saying, “He sent me like, millions of 1990s photos with tiny little glasses like this.” Kanye was apparently right on target and tons of stars have been spotted wearing the trend from Stranger Things star Millie Bobbie Brown to Rihanna. If you decided to rock this trend you are sure to be one of the most fashionable around. Last year was the year of the corset belt and corseted shirt which was seen on countless runways and was also sported by the likes of Kylie Jenner and Kim Kardashian. However, according to fashion mavens this look is now out for 2018 and the wide belt is back in. However, like the corset belt, the wide belt is a great option for cinching and accentuating the waist which is always a desirable look. 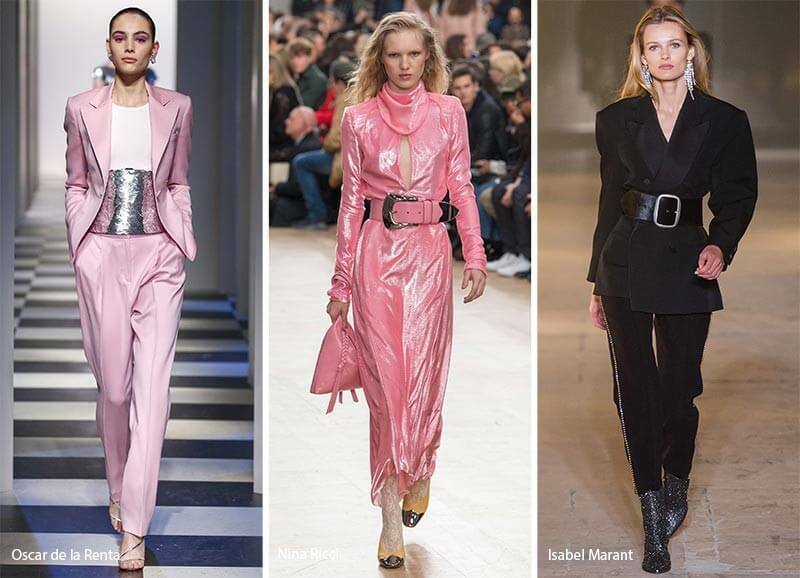 The wide belt can also be styled numerous ways, from a throwback to the retro 1950s over a dress or for a more modern take, over a utilitarian jumpsuit. The best thing about a belt is that while the fashion changes from season to season they are an easy and typically inexpensive way to update your wardrobe. Last year had a lot of celebrities and fashionistas sporting skater sneakers which is a trend that seems to be a bit like a revolving door. However, in 2018, skater sneakers are out and dad sneakers are in. They have already been seen some of the hot “It” girls on the scene, with models Bella Hadid and Kaia Gerber sporting the look. 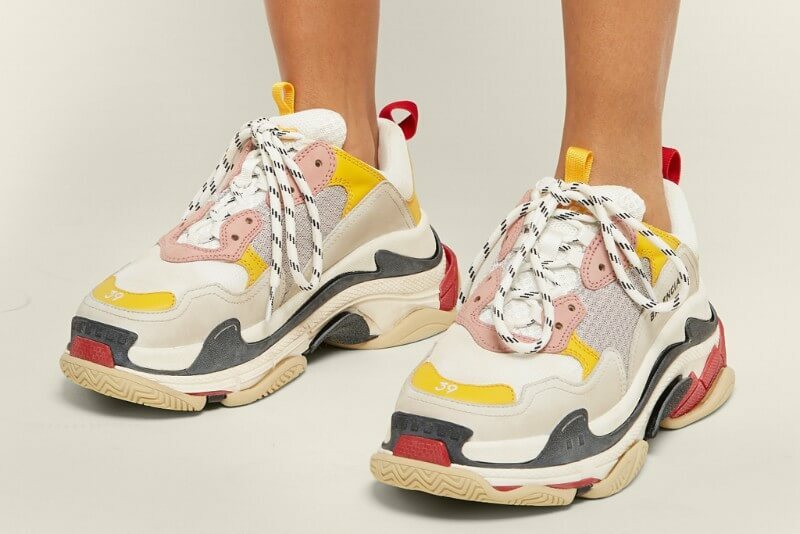 Balenciaga launched a Triple S trainer that has been super popular, and Prada followed suit soon after. However, as high-end brands they are a bit out of reach for most people. Reebok is said to be launching their own look soon that will probably be a go-to for all the fashion lovers out there that love to up their shoe game. 2018 has brought the launch of Samsung’s Relúmĭno Smartglasses. These glasses were made with the intention of helping those who are partially sighted. For some, this could mean they are wearing a truly lifechanging piece of technology. The glasses were developed with a concept taken from the Samsung Gear VR headset which allows wearers to be able to see images clearer when they are viewing something or even reading. You do need a smartphone to be able to interact with the device. The tech can even change based on what your head movements are for instance, looking down to read. We might be on the road to a totally new way to confront vision problems!